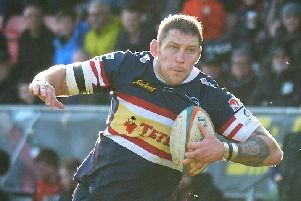 Doncaster Knights coach Glen Kenworthy has defended the club’s use of the dual-registration system - and says it is a vital source of help for Championship clubs. Knights’ close links with Premiership giants Leicester Tigers has seen young prospects Riccardo Brugnara, George Catchpole, Tiziano Pasquali, Rhys Williams, Harry Thacker and Laurence Pearce all turn out for the Castle Park club this season. It was not lost on some Doncaster supporters that victory over Munster A in the British & Irish Cup quarter-finals last weekend was achieved without any dual-registered players. However, Kenworthy was quick to defend the system. “A lot of the Championship clubs live under a big brother,” he said. “The funding in the Championship is not enough and you need help from bigger clubs. “The only time the boys do come up from Leicester is when we’ve got injuries. “The boys who played for us against Jersey were Harry Thacker, who had a good game, Laurence Pearce, who had an okay game and George Catchpole who has played well for us every time he’s been up here. “There are others and they are all good boys and they quickly change from Leicester mode to Doncaster mode. Doncaster resume Championship action on Saturday when they make the somewhat daunting trip to title challengers Worcester Warriors. Clive Griffiths’ men have lost their last eight league games on the spin.